Alice Roberta (McIntosh) Blake of Black Point, NB and more recently McNair Manor in Moncton passed away on December 7, 2018 at the age of 97. Alice was predeceased by her husband, William A. (2003) and her son Alexander Wilfred (2013). 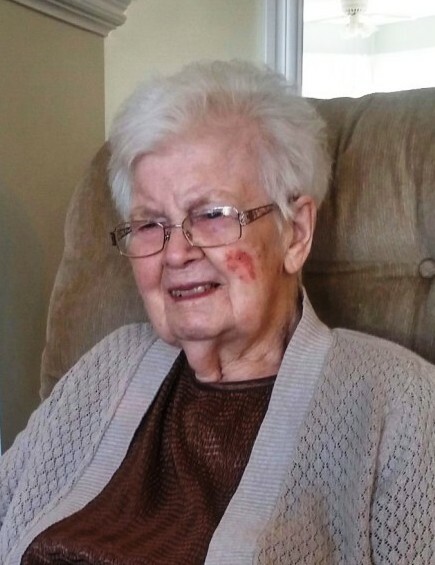 She is survived by her daughters Mary Pelletier (Gilles), Mabel Jamieson (Errol), sister ,Eva Wetmore, sister-in-law Muriel Blake, daughter-in-law Debbie Blake,8 cherished grandchildren and 6 adorable great grand children and several nieces and nephews. Alice lived by the motto-“Do unto others as you would have them do to you” as shown in her dedication and love for her family, church ,community and many years of active membership in the Order of The Eastern Star. A funeral service to celebrate and honor Alice’s life will be held on June 1, 2019 at Bethel United Church in Nash Creek, NB.at 11am. In memory of Alice, donations to the New Mills Protestant Cemetery fund or the charity of your choice will be appreciated. At this time the family wishes to offer their heartfelt thanks to the staff of McNair Manor for the wonderful care provided to our mother. Funeral arrangements are under the professional care of MacMillans Funeral Home in Black Point, NB. There's still time to send flowers to the Funeral Service at the Bethel United Church,Nash Creek at 11:00 AM on June 1, 2019.